You know when you come across something that just fits - not just in size, but in personality? That's how it was when my sister discovered these comfy cotton-terry pullovers at our most beloved place to shop, Anthropologie. I absolutely LOVE all three of these sweatshirts. Kelly bought the "CIAO" and I immediately wanted it. I almost bought the same one, until I saw the other styles. I followed suit with "LA FEMME." It took little convincing for my youngest sister to get the "JOIE DE VIVRE." We all share clothes, and I know these will be on rotation, given their ease and versatility. While the humble sweatshirt might be something most throw on to run an errand or hit up the gym, it's also become a super-chic layering staple. I love a slouchy, relaxed look for that low-maintance, off-duty vibe. Elevated weekend wear, all-the-time wear. I got mine in a small, and probably could have gotten away with an XS, given the "oversize" nature of the look. (I like to have a little more room!) If you are on the fence about a clever graphic sweatshirt, go for it! Not only are they comfortable, but they are stylish and cute. Perfect for when you don't know what to wear, great paired with jeans and boots/flats. Lately I've been into the juxtaposition of a flouncy skirt with a casual top. I could see any of these paired with feminine tulle and sporty sneakers. As you can see, over the holidays my besties/sisters were in town (que: we're the three best friends that anybody could have!) and we all cozied up in our graphic sweatshirts for a little fun in the snow. I convinced Rob to hang the tree swing and wrap it in twinkle lights. I love how it turned out! When it's all lit up it reminds me of a little doll house accessory lol. It's been too cold to go outside and play again, but I can't wait to get some sure-to-be-entertaining pictures with the kids! 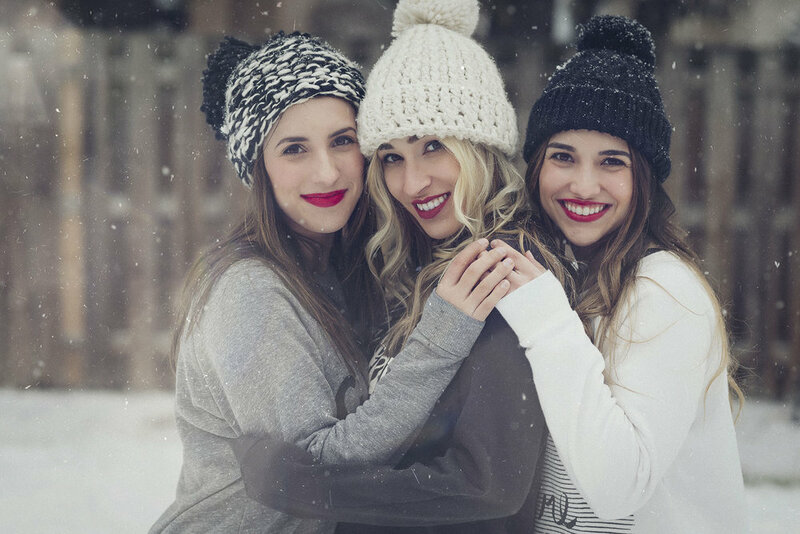 It was magical to have a white Christmas, but now that the temps are dipping even lower into the negatives, I would recommend buying and wearing all three of these at once!! Do you think sweatshirts can be stylish? Which one would you pick? I'd love to know in the comments below!